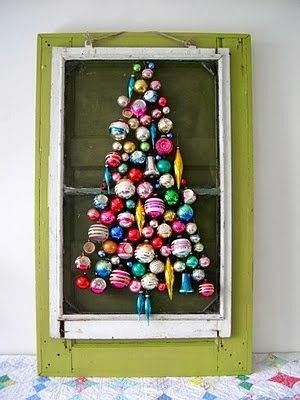 This is such an awesome idea and I love using vintage Christmas ornaments for this tree! What a great way to keep the vintage ornaments through the years! This is the cutest Christmas decoration ever! Whenever I break an ornament from a set, I can save the other’s and recycle the other’s! I love this also – such a neat idea for all of those different style and colored vintage glass ornaments!